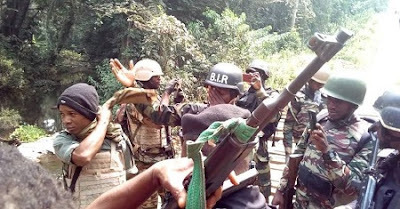 About 100 Cameroonian soldiers have allegedly crossed international borders, invading Danare community in Boki Local Government of Cross River State, The Nation learnt last night. It was gathered that the soldiers claimed they were after Cameroonian militants, who took refuge in the community. Over 3,000 refugees from Cameroon, who fled following unrest, are in the border community. sporadically and forcing people to scamper for safety. He said: “Our people did not sleep yesterday (Monday) because gendarmes from Cameroun invaded our community, claiming to look for Ambazonia militants. The militants, who have since taken refuge in the surrounding forests, also shot into the air. The community was in chaos and fear. “It is important to recall the sad invasion of Danare community by Cameroonian soldiers on January 25, during which more than 80 well-armed soldiers crossed the international boundary at Danare-Daddi/Danare-Bodam and abducted five people. “When leaving, they said their mission was to warn residents that they would return to carry out a military raid, which, according to them, is intended to rid Danare communities of Ambazonia refugees. “The soldiers threatened to return to Danare to attack Southern Cameroonians taking refuge in the community, following crisis in Ambazonia, which resulted in influx of refugees from neighbouring Southern Cameroon villages to Danare and other Nigerian communities. “This is a calculated offensive from Cameroonian military on Nigeria. They have shown defiance to supremacy of Nigerian territorial sovereignty and defied the consequences of crossing international boundary to carry out intimidation and harassment of people.